Hello, my name is Jim Valdes, and my call is WA1GPO. I’ve been a licensed radio amateur for more than 45 years having passed my Novice exam at the age of 10. Amateur radio has had a major impact on my life; from the friends I have made, to my choice of career (engineer), to my family – KA1TJU, WB1DRS, N1MYF and WA1GTL (sk) are all family members ! 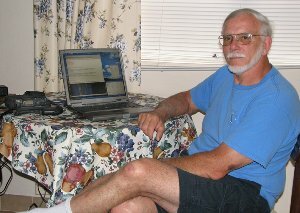 I currently live in Falmouth, MA and have been a member of the Falmouth Amateur Radio Association (FARA) for more than 35 years. I’m on the technical staff at the Woods Hole Oceanographic Institution (http://www.whoi.edu). My work takes me to sea for an occasional 2 to 4 week expedition. I’ve carried ‘ham’ equipment all over the world and operated maritime mobile from the high seas. In the early years I handled numerous phone patches from ships at sea. My current project brings me to the Island of Bermuda 4-6 times a year, for 4 – 7 days at a time… rough duty but someone has to do it! While on the island I work out of the Bermuda Institute of Ocean Sciences (http://www.bios.edu/). In the past 30+ years I’ve been to Bermuda numerous times (est. 100), it’s one of my favorite places. My first was on my honeymoon with a 2 meter HT - this is where I first met Ed, VP9GE. Generally, on the short trips, I only carried a VHF HT for 2 meters when I traveled. More recently I’ve acquired a Yaesu FT-817, 5 watt, all mode transceiver, It’s a great little radio. I pack it in the front pouch of my laptop bag and ship all of the accessories in my checked luggage. I’ve never had a problem with Customs. I always carry a laptop computer when I travel hence my favorite mode is PSK-31. It’s quiet in hotel rooms and it really performs well with a low power radio. A couple of years ago I became reacquainted with Ed, VP9GE. Most recently I’ve been staying in one of Ed’s apartments on my trips to Bermuda. As you can see from the visiting operator’s pages many of Ed’s guests are very competitive contesters. I’m not a contester, just a casual operator, but having access to the antennas at VP9GE give me a decided edge with the 5 watt QRP radio. VP9 seems to be in demand from the PSK-31 crowd. On my last visit one call on 20 would routinely generate a run lasting an hour or more! I also managed a few SSB contacts, and worked a couple of FARA members while there – K1WCC on 40m PSK and KA1BXB on 160m & 80m SSB. Not bad for 5 watts!! Many thanks to Ed for his hospitality - being able to operate HF while in Bermuda makes the days away from home much more enjoyable.